For over sixty-five years Antoine de Saint-Exupéry's The Little Prince has captured the hearts and minds of its readers. The whimsical story with a fairy tale touch has sold over 80 million copies in 230 languages. This exciting graphic adaptation features beautiful, new artwork by Joann Sfar. Hand-chosen by Saint-Exupéry's French publishers for his literary style and sensitivity to the original, Sfar has endeavored to recreate this beloved story, both honoring the original and stretching it to new heights. A vibrant, visual gift for longtime fans and those experiencing the story for the first time. 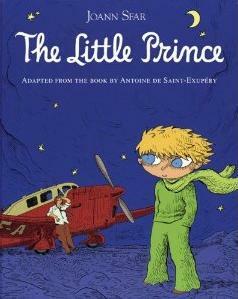 I have never read The Little Prince despite the many amazing things that I have heard about it. Now that I'm older, I decided that it was time to see what all the magic was about. When I saw that there was a graphic novel version, I jumped at the chance to review it! If I'm being completely honest, on my first read through this graphic novel I was utterly confused. Having never read the original version before, I think the pictures threw me off a bit. However, despite being confused, I did see some a glimmer of magic behind it all. That is what inspired me to slow down and give the graphic novel yet another read through. The second read through I took the time to pour over each page. Joann Sfar's illustrations are engrossing, and as I slowly unraveled the storyline I became more and more enamored with each page. It is evident why Joann Sfar was chosen as the illustrator. Overall, I'd recommend the graphic novel version to mainly adults. Although the illustrations are extremely mesmerizing, I do believe that children would be a little put off by them. They are extremely exaggerated in color and symmetry, and sometimes confusing. This new version is probably better suited to adults who enjoyed the story as a child and are eager for a fresh take on their favorite story! It is difficult to put into words exactly how The Little Prince affected me. I came away with a sense of the inner child that dwells within all of us, and how easy it is to forget that part of us is there. As the prince visits various planets in his travels, he comes upon adults who he finds confusing and frustrating. Each of them are so set about finishing their tasks, that they have no time for him and his whimsical ideas. It made me ponder if we as adults really do come across like this to children. Too busy for them and their nonsense? I certainly hope not, and I believe this inner journey is part of the magic of The Little Prince. Well at least for adults. I'm sure children will come away with something else entirely. This graphic novel has definitely inspired me to seek out an original version to read, as I would love to see where this beauteous story began. I'll wrap this up by simply saying that I did enjoy the story, and I believe this new version adds another level to the beauty of it all. If you enjoy graphic novels and perhaps loved this story as a child, I would recommend this to you.